At first glance, this part of the process might look a bit complicated. It might take a few minutes to review, record, and summarize your personal experience, but you will find the finished product is well worth your time. First, think back through your flight training and complete the Certification Training, an Experience Summary chart in Figure 8-2. The Certification, Training, and Experience Summary is adapted from the FAA’s Personal and Weather Risk Assessment Guide (October 2003). It can be found at www.faa.gov. Figure 8-2. Certification, training, and experience summary. Next, think through your recent flying experiences and make a note of the lowest weather conditions that you have comfortably experienced as a pilot in your VFR and, if applicable, IFR flying in the last 6–12 months. You might want to use the charts in Figures 8-3 through 8-5 as guides for this assessment, but do not think that you need to fill in every square. In fact, you may not have, or even need, an entry for every category. Suppose that most of your flying takes place in a part of the country where clear skies and visibilities of 30 plus miles are normal. Your entry might specify the lowest VFR ceiling as 7,000, and the lowest visibility as 15 miles. You may have never experienced MVFR conditions at all, so you would leave those boxes blank. Figure 8-3. 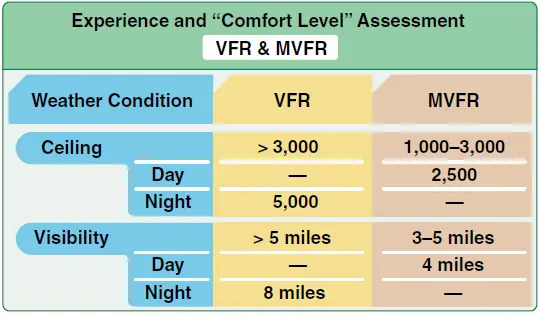 Experience and comfort level assessment for VFR and MVFR. Figure 8-4. 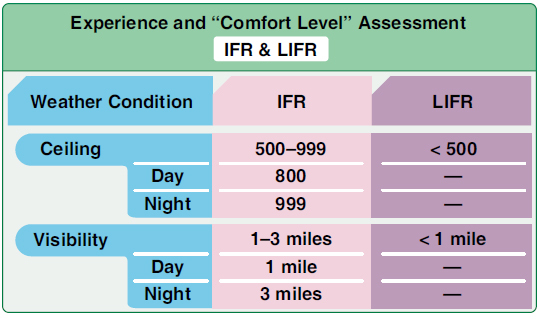 Experience and comfort level assessment for IFR and LIFR. Figure 8-5. Experience and comfort level assessment for combined VFR and IFR. For example, in a part of the country where normal summer flying often involves hazy conditions over relatively flat terrain, pilots who know the local terrain could regularly operate in hazy daytime MVFR conditions (e.g., 2,500 and four miles), and would use the MVFR column to record these values. Even in your home airspace, you should not consider flying down to VFR minimums at night—much less in the range of conditions defined as MVFR. For night VFR, anything less than a ceiling of at least 5,000, and visibility of at least seven to eight miles should raise a red flag. 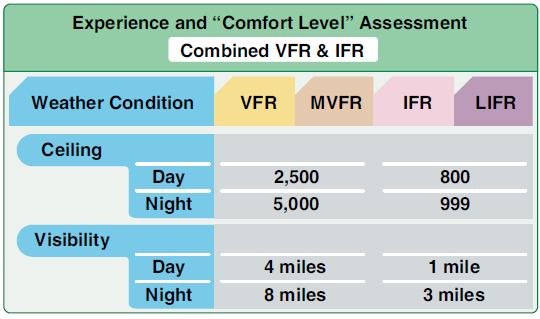 Figure 8-3 shows how your entries would look in the Experience & Comfort Level Assessment VFR & MFR chart. If you fly IFR, the next part of the exercise shown in Figure 8-4 is to record the lowest IFR conditions that you have comfortably, recently, and regularly experienced in your flying career. Again, be honest in your assessment. Although you may have successfully flown in low IFR (LIFR) conditions-–down to a 300 foot ceiling and ¾ mile visibility—it does not mean you were “comfortable” in these conditions. Therefore, leave the LIFR boxes blank with entries for known “comfort level” in instrument meteorological conditions (IMC), as shown in Figure 8-4. 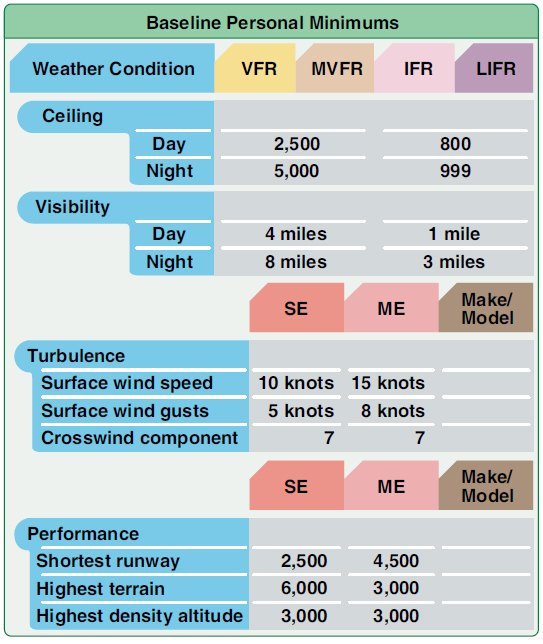 If entries are combined into a single chart, the summary of your personal known “comfort level” for VFR, MVFR, IFR, and LIFR weather conditions would appear as shown in Figure 8-5. Ceiling and visibility are the most obvious conditions to consider in setting personal minimums, but it is also a good idea to have personal minimums for wind and turbulence. As with ceiling and visibility, the goal in this step is to record the most challenging wind conditions you have comfortably experienced in the last 6–12 months—not necessarily the most challenging wind conditions you have managed to survive without bending an airplane. As shown in Figure 8-6, you can record these values for category and class, for specific make and model, or perhaps both. Figure 8-6. Experience and comfort level assessment for wind and turbulence. In addition to winds, your “comfort level” inventory should also include factors related to aircraft performance. There are many variables, but start by completing the chart with reference to the aircraft and terrain most typical for the kind of flying you do most. [Figure 8-7] Remember that you want to establish a safety buffer, so be honest with yourself. If you have never operated to/from a runway shorter than 5,000 feet, the “shortest runway” box should say 5,000 feet. We will talk more about safe ways to extend personal minimums a bit later. Figure 8-7. Experience and comfort level assessment for performance factors. Now you have some useful numbers to use in establishing baseline personal minimums. Combining these numbers, the Baseline Personal Minimums chart in Figure 8-8 shows how the whole picture might look. Figure 8-8. Baseline personal minimums. Any flight you make involves almost infinite combinations of pilot skill, experience, condition, and proficiency; aircraft equipment and performance; environmental conditions; and external influences. Both individually and in combination, these factors can compress the safety buffer provided by your baseline personal minimums. Consequently, you need a practical way to adjust your baseline personal minimums to accommodate specific conditions. Note that the suggested adjustment factors are just that—a suggestion. If your flying experience is limited or if you do not fly very often, you might want to double these values. In addition, if your situation involves more than one special condition from the chart above, you will probably want to add the adjustment factor for each one. For example, suppose you are planning a night cross-country to an unfamiliar airport, departing after a full workday. If you decide to make this trip—or you might decide that it is safest to wait until the next day—the chart in Figure 8-9 suggests that you should at least raise your baseline personal minimums by adding 1,000 feet to your ceiling value; one mile to visibility, and 1,000 feet to required runway length. Figure 8-9. Examples of baseline personal mimimums. How about adjustments in the other direction? Some pilots fear that establishing personal minimums is a once and-for-all exercise. With time and experience, though, you can modify personal minimums to match growing skill and judgment. When you have comfortably flown to your baseline personal minimums for several months, you might want to sit down and assess whether and how to push the envelope safely. If, for instance, your personal minimums call for daytime visibility of at least five miles, and you have developed some solid experience flying in those conditions, you might consider lowering the visibility value to four miles for your next flight. Never adjust personal minimums to a lower value for a specific flight. The time to consider adjustments is when you are not under any pressure to fly, and when you have the time and objectivity to think honestly about your skill, performance, and comfort level during last the few flights. Changing personal minimums “on the fly” defeats the purpose of having them in the first place. Keep all other variables constant. For example, if your goal is to lower your baseline personal minimums for visibility, don’t try to lower the ceiling, wind, or other values at the same time. In addition, you never want to push the baseline if there are special conditions (e.g., unfamiliar aircraft, pilot fatigue) present for this flight. You might find it helpful to talk through both your newly established personal minimums and any “push-the-envelope” plans with a well-qualified flight instructor. Step 6—Stick to the Plan! Once you have done all the thinking required to establish baseline personal minimums, all you need to do next is stick to the plan. As most pilots know, that task is a lot harder than it sounds, especially when the flight is for a trip that you really want to make, or when you are staring into the faces of your disappointed passengers. Here’s where personal minimums can be an especially valuable tool. Professional pilots live by the numbers, and so should you. Pre-established hard numbers can make it a lot easier to make a smart no go or divert decision than a vague sense that you can “probably” deal with the conditions that you are facing at any given time. In addition, a written set of personal minimums can also make it easier to explain tough decisions to passengers who are, after all, trusting their lives to your aeronautical skill and judgment.